Mead's Court was a court containing two humble dwellings off Vicarage Street that only appears separately in the census returns occasionally. It is, however, indicated on Bidder's map of 1843 as well as various other maps to the 1903 Ordnance Survey. 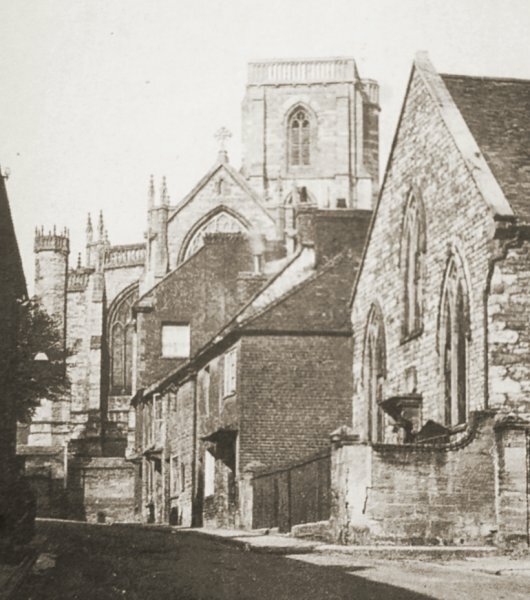 Two families lived in the court in 1851; 60-year old tailor Isaac Court, his wife Lydia and their five children aged between 29 and 7, and John Rodgers, a 42-year old agricultural labourer. Rodgers lived in the court with his wife Mary, daughter Eliza aged six and two sons - both glovers, one aged 21 the other aged 15 and BOTH called John. In 1881 one of the dwellings was occupied by 38-year old 'Glover & Pensioner' (presumably military) Henry Randall, his wife Emma and their daughter Esther. The other was occupied by glover John Hill, his wife Mary, also a glover, and their three children; Dorcas, Emily and William. In 1891 labourer John Cross and his wife Eliza lived in one cottage while bricklayer Albert Phillips, his wife Seraphine and their four children lived in the other. In 1881 and 1891 the small house with a passageway leading to Mead's Court was known as the Tinman's Shop and was occupied by 'Tinman & Brazier' Alfred White, his wife Lucy née Gale, their five sons and a servant. By 1901 Mead's Court had become known as White's Yard and the census listed 58-year old general labourer William Stagg, his 60-year old charwoman wife Charlotte and their 38-year old bricklayer son Frank in one cottage while in the other cottage lived 48-year old leather parer Alfred Moore with his 80-year old mother, Charlotte. Mead's Court / White's Yard was demolished in the early twentieth century. 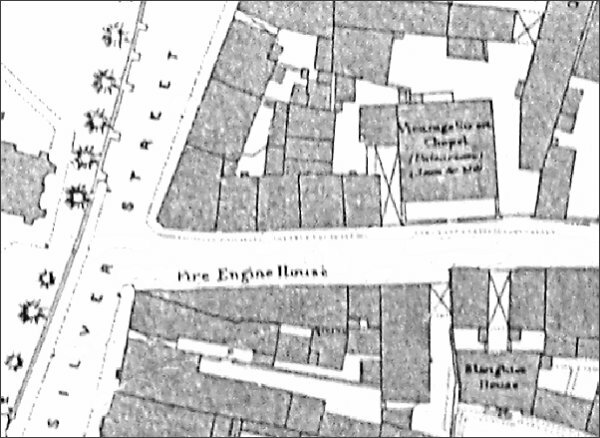 An enlargement of the 1886 Ordnance Survey showing the Unitarian church as the large, square building towards upper right. To its immediate left is an area with crossed lines indicating a passage under the adjoining building leading to Mead's Court, at centre, with its two small dwellings facing the small enclosed yard. An early photograph dating to around 1900, of the western end of Vicarage Street looking towards Silver Street. The buildings at centre predating Percy Winsor's building. The Unitarian church, rebuilt in 1809, was in use at this time and was built on the site of the medieval Chantry of the Blessed Virgin Mary. The canopy casting a deep shadow on the house next to the church is the passageway that led through to Mead's Court. In 1881 and 1891 this small house was known as the Tinman's Shop and was occupied by 'Tinman & Brazier' Alfred White, his wife Lucy, their five sons and a servant. 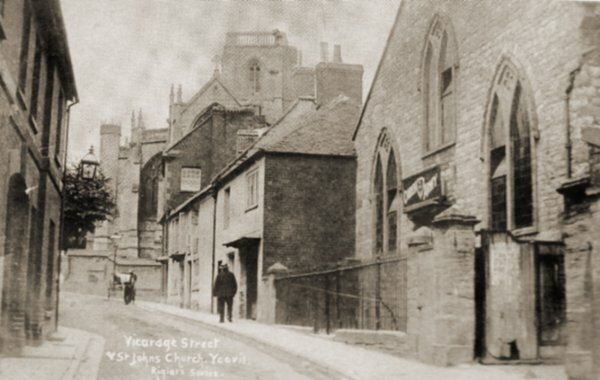 A slightly later photograph, probably dating to around 1910, of the same scene with the man walking past the passageway, with its canopy, leading to Mead's Court.